This year Americans will be going into the Martin Luther King Jr. federal holiday feeling a sense of division and hopelessness. This is largely because of the battle that has been raging between the two political parties. For the first time in many years the country is feeling a sense of uncertainty. This feeling has been growing for sometime but has intensified since Mr. Trump took office and so people are now hoping we can get back to a time when we felt peace, freedom, justice and some common decency from each other. African Americans have been fighting for equal rights and justice for more than 400 years and when there seem to be some glimmer of hope, reality kicks in. America had many opportunities to learn from the lessons of the past, but somehow fail to negotiate through the mistakes to ever learn. Children who are now adults in this modern world, have not grasp the concept of true living. This is largely because we now live in a society where elected officials continuously fail to take actions to protect them from other citizens who claim their 3rd Amendment rights to bear arms. It has now become shameful to watch the continued demonization of outside cultures, whilst the enemy we should fear are those who are born and grown in this land of the free. Since those words were utter back in the 1960s, somehow it rings true even today because it is obvious that America has defaulted on this promissory note in-so-far as her citizens and alien residents are concerned. Right now in a fight over whether a racially driven border wall should be built, the government was partially shutdown and more than 800,000 government workers are furloughed and/or forced to work unpaid. This is evidence that the country have not dealt with nor learn the lessons of the past and are now reliving them. Just like the policies of Jim Crow which helped to criminalize black men because of fear and a need for free labor, the America we now live in, institutionalize millions of people through the criminal justice system. This is in part to the privatization of prisons, bail and parole systems. When Dr. King asked for freedom and justice, this was not what he was hoping the country would become. However, even in times of uncertainty Dr. King reminds us that we must believe that the bank of justice is not bankrupt. We can demand the riches of freedom and the security of justice for citizens and for those who work among us, live among us and suffer as we do but do not possess the benefit to be called a legal alien within this country. Although our elected officials continues to disappoint us, there is still hope. Those words of optimism echoed through the speakers of the U. S. Capitol in January 2009 where an estimated 1.8 million people huddled in the cold, and tens of millions more around the world watched and listened on TV. With the Capitol, that symbol of democratic freedom and power as a backdrop, the message of hope was delivered by then President Barack Hussein Obama. He inspired a new generation of people to believe that change is on the horizon and it should not be feared. Regardless of the circumstances, hope should never be abandoned. And with those guiding principles we must take heed. As I sit here tonight, reflecting on the history that binds us together as a people, I am drawn to the perils we faced and the struggles we had to overcome in order to create a future that is close to the freedom our ancestors dreamt of. Even when we believe we have made it to the promise land, we are reminded that getting there is only the first part of the journey, living there is another. We cannot allow ourselves to be driven by the desires of others and not our own. The principles, morals, ethics and beliefs we possess must be shared by those who intend to lead us. When we recognize the imbalance of illogical leaderships, we must use the process within the system to root them out. We want to create a Union that is balanced from the public to the private sector. We want a system that is uncorrupted in the public and the private sector. We want a government that is of the people and is for the people. Our journey has not ended, we have a long way to go, therefore we must give ourselves the opportunity to serve and do it for the betterment of this great nation. I am tired of hearing people claiming they are patriots but cannot explain the simplistic description of what it truly means to be one. Our generation is fading into the obscure world of nonsensical realities and as a result they are giving up their rights to consciously select ethical leaders who will consider the consequence of their actions while in office. 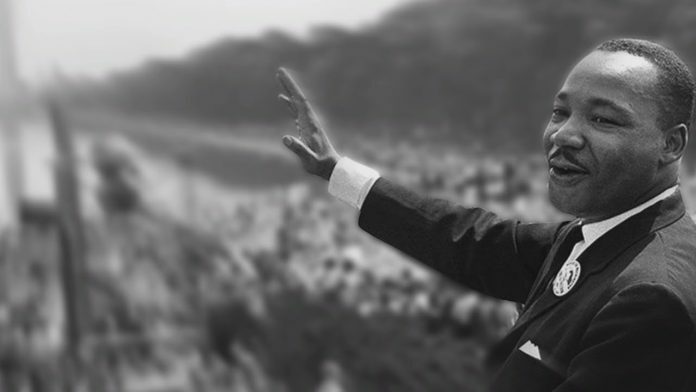 Although Dr. King exclaimed “Free at last” at the end of his speech, the irony is not lost on the fact now, because we still have people of this nation who are still not free. Their freedom is captive to political policies that are of special interests and driven by monetary compensations of private companies to government officials. Base on numerous reports from several news agencies, the current administration is clouded under many criminal investigations, which are signals that a change is going to come. This is a glimmer of hope and on this day we must celebrate the fact that for more than 40 years, America have transformed itself into a place where people with nothing can capitalize on opportunities to become successful. This is in spite of the racial and systematic adversaries that are constantly stocked again them. On this day, we must reflect on those who paved the way, died in the struggle for peace, freedom, justice and common decency for all.